The seal and the spoon with the d'Urberville crest are the only things the Durbeyfields have left from their noble heritage. The smallness and uselessness of the items is a symbol of how the d'Urberville name means nothing anymore in terms of real wealth or influence. Tess thinks angrily of them as essentially causing her misfortunes by proving her kinship to the wealthy d'Urbervilles. They are also associated with the old tombs of the d'Urberville knights, which again seem grand but are in effect worthless, full of nothing but the dead. The timeline below shows where the symbol Seal and Spoon appears in Tess of the d'Urbervilles. The colored dots and icons indicate which themes are associated with that appearance. Cosby, Matt. "Tess of the d'Urbervilles Symbols: Seal and Spoon." LitCharts. LitCharts LLC, 3 Nov 2013. Web. 21 Apr 2019. Cosby, Matt. "Tess of the d'Urbervilles Symbols: Seal and Spoon." LitCharts LLC, November 3, 2013. 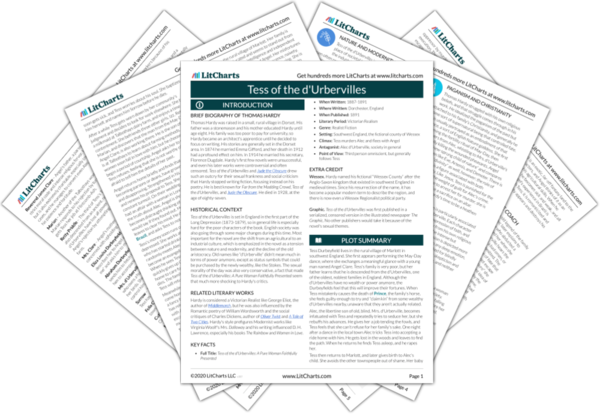 Retrieved April 21, 2019. https://www.litcharts.com/lit/tess-of-the-d-urbervilles/symbols/seal-and-spoon.